Home made food is healthier! Most manufactured food contains too much polyunsaturated fat, omega-6, salt and chemical additives. It has been proved that calorie for calorie some kinds of food satisfy hunger longer than other kinds, so if you eat more hunger-satisfying foods you won't feel the urge to top up on unnecessary snacks or eat more than you need to. What kinds of food are these hunger stoppers? They are mainly foods high in protein and fat, especially saturated fat. You can find a list of them in Chapter 19 of Twenty-First Century Nutrition and Family Health, as well as the scientific evidence in support of these statements. To lose weight you don't have to spend a fortune on diet foods and tasteless low-fat foods, nor endlessly count up calories. Just eat the right kinds of food, stop eating the wrong kinds, and use a smaller fork. 75 years ago hardly anyone was overweight, yet they didn't feel hungry all the time. To learn how to lose weight naturally buy the book now. It's had some great reviews. Calorie for calorie, protein- and fat-rich foods satisfy hunger for longer than carbohydrates do, so you will eat fewer calories if you eat more fat and 'cut the carbs'. As long ago as 1932 some overweight British patients were put on a high carbohydrate, low-fat diet, while a similar group was put on a low carbohydrate, high-fat diet. The patients on the low-fat diet lost on average 49 gm of weight a day, but the ones on the high-fat diet lost 205 gm a day. A few years agp Marks and Spencer introduced a range of high-protein foods for dieting, called 'Simply Fuller Longer'. This was based on the same principle that protein-rich foods satisfy hunger longer than carbohydrate-rich foods do. Weight Watchers also revised their dieting advice on a similar principle. Being overweight increases your risk of heart disease, strokes, diabetes, cancer, arthritis, orthopaedic problems, asthma and sleep apnoea. If you want to lose weight and keep it off, eat more fat and fewer starchy carbohydrates like bread, potatoes, rice, pasta, cakes and pastries. 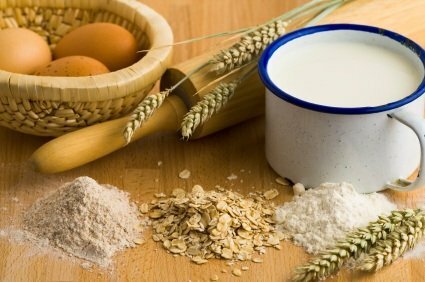 Another problem with carbohydrates is that the body converts them into blood sugar faster than it converts protein and fat, with the result that carbohydrates can produce more sugar in the blood than the body requires for immediate use in the muscles or the central heating system. When that happens the body turns the excess sugar into fat to store it for later use. Eating more fat does not mean you should consume more plant-based fats and oils, which are high in polyunsaturated fatty acids that are prone to oxidation and the production of free radicals. The fats we should be using are those which people used until 75 years ago, when obesity, coronary heart disease and Type 2 disabetes were virtually unknown - animal fats such as lard and butter and full cream milk and cheese. These contain relatively more of the stable saturated fatty acids and a much healthier balance of the omega-3 and omega-6 fatty acids than plant-based fats do. Twenty-First Century Nutrition and Family Health explains more fully the science behind this. Of course there are other steps one can take to maintain a healthy weight, including eliminating added sugar, taking regular appropriate exercise, reducing total food intake, and learning how to overcome snack addiction. A full explanation of how to do all these things is given in Twenty-First Century Nutrition and Family Health. Learn more about it.